November 1918. The end of the war to end all wars. Would that it had been so. In 1918 Mbala was called Abercorn. The town was – is – close to the border between Northern Rhodesia (now Zambia) and German East Africa (now Tanzania). Livingstone was the first white man in town, in the 1860s, but Abercorn quickly became a strategic outpost for imperial Britain, sitting as it did on the northern edge of her southern African territories. The Great War, the first to be named a World War, was fought even in remotest Africa. But news travelled less quickly in 1918. The Armistice in Germany was signed on the eleventh day at the eleventh hour of the eleventh month, a time remembered in silence still today. German forces near Abercorn, though, remained undefeated – and unaware. By November 25th the news had arrived. The colonial Germans dutifully surrendered, in Abercorn. There’s a small memorial – and a gun (well, something military) on a roundabout. Modern Mbala’s an odd place. Quiet, despite its proximity to international borders – not just along the road, but across Lake Tanganyika, where ferries sail to the Congo from the port of Mpulungu. Today, on this national holiday, there’s not a drop of paraffin to be bought in Mbala. 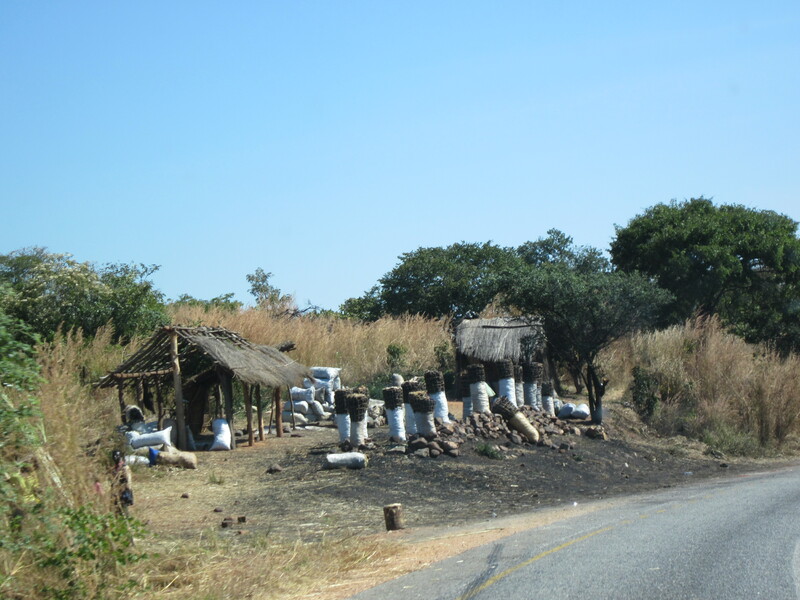 What’s more, there’s been no charcoal for sale on the road into town – and that’s a mite concerning. Because here charcoal’s not just a ‘let’s have a barbie’ luxury, it’s essential for everyday cooking. It’s a vital rural resource – and one reason so many trees are vanishing from the landscape. The Great North Road is usually dotted with stands of huge sacks, chock-full with black chunks, waiting to be bought. Just to prove this was taken from a moving vehicle I decided not to crop it. 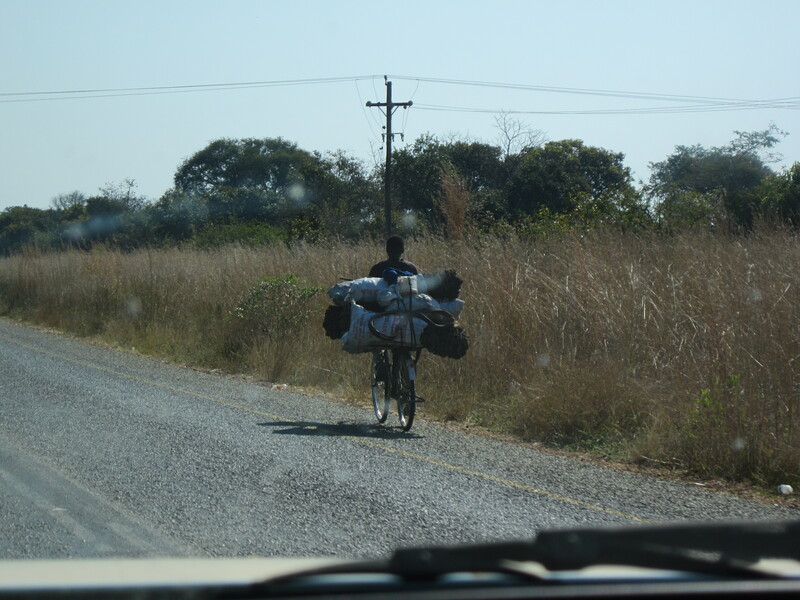 This man, cycling on the wrong side of the road (normal), has a medium sized load of charcoal and very strong legs! Men wobble around bearing perilous loads on the back of their sturdy bikes. Today we kept on driving, waiting to buy till we were nearer our destination. And we’re onion-, pumpkin-, orange- and cabbage-less. Because we haven’t passed a single stall selling vegetables. With relief we discover Mbala’s market, a few hardy traders braving this serious holiday. There’s an unusual selection of produce, including pears. And carrots. So I won’t be cooking slices wrapped in foil, with tomato and a bit of butter, on the ashes of our fire. Even if we find wood. Even if we buy charcoal. The paraffin situation could have been serious too, but – hooray – an Indian grocery is open on the main street. There we stock up on candles. And, on reflection, more candles. Pale Chinese candles that will sputter and drip by night and bend in the heat of the day. Looking flaccid and somewhat obscene. Sorry, but they do. And finally, for now, something so essential we can’t go without it. At a communal tap we fill our barrel to the brim. Heave it into the back of the least full of our three vehicles. I lapse into a worried silence as we bump and jolt our way past the jail, along the track to Moto Moto Museum. Sandwiches, if the worst comes to the worst, that’s what we’ll have tonight. The prison’s a dire warning to the lawless. In a bare compound surrounded by barbed wire, each convict has the equivalent of a small, corrugated metal garden hut. Baking by day, freezing by night. Curly-tailed dogs follow our dust to the museum – a white-painted gem, founded by a Jesuit. Inside is a full scale village scene, artefacts from Kalambo, pickled snakes, a treasure trove of a gift shop – and the flushing loo. We’re greeted by an old friend, Nkole. He’s had stools made for us to sit around our camp fire. But, it’s the wrong kind of wood, he’s sending them back. What’s that? You’re wondering why we can’t sit on the ground? It’s no fun, at night, trust me – never mind the discomfort, think scorpions and other nasty nippers. Anyway, we’re offered two benches from the museum. These we strap to the vehicle roofs, alongside the jerry cans of diesel. There are still four more members of the team to arrive so we’ll have to come back for the new stools later. Nkole assures us there’ll be charcoal nearer the site. I hope he’s right. All too soon it’s time to depart. To pour water from the museum’s barrel into the loo cistern, flush it one last time. Who knows what our toilet arrangement will be at the Falls. But – we have water, pears, carrots, candles. And the promise of charcoal. The turning’s not too far out of town, past a lake, just where the tarmac gives way to dirt. Yes, that’s the main road into Tanzania. We leave it and head down. There are things you can trust guide books for, things you can’t. Trouble is, you don’t know which is which till you’ve tried it. Fortunately we’ve been here before. The Bradt guide book says you don’t need a four by four. I beg to differ. The water barrel sloshes, tips ominously as the vehicle jolts down each precipice of rock. It’s as we reach a relatively smooth stretch of sandy ground that we spot the charcoal. Anthro-man turns to me and mutters, ‘You’re in charge, go on, buy some’. Collins (who’s now the esteemed Director of the National Heritage Conservation Commission) jumps down to help. It’s not his tribal area, but among the 70-odd languages of Zambia several are understood almost everywhere. This area is Mambwe. I quickly learn the greeting. ‘Indiningo’ responds my teacher, with a laugh at my accent. I wonder who chose that one? Did they mean to name him Custer? Ah well, it’s memorable. Custard’s happy to sell us charcoal, but wants to put more in the bag. Collins agrees we’ll come back later and we settle on a price. I’m about to open the passenger door but … it’s the weekend. Before I have a chance to re-embark the regulation drunk arrives. A friendly, inquisitive chap, he shakes my hand for an age. When, finally, he lets go, I climb back on board with a sense of achievement. Tonight we’ll have hot food. After we set camp, that is. And that’s the next challenge. Last time we came there were no facilities. Do we camp in the field near the river and sites? Dig pit latrines? Whose permission will we need? But as we drive into the parking area by the falls we see them – ‘his’n’hers’ long drop loos. We have a camp site. No showers or running water, of course. My reluctant, vertiginously handicapped knees soon discover where we’ll be bathing. Down many, many steep steps. At the lip of the second highest waterfall in Africa. An infinity pool of sorts. Especially if you slip. This entry was posted in Zambia and tagged Abercorn, German East Africa, Great North Road, Kalambo Falls, Lake Tanganyika, Mbala, Moto Moto Museum, Mpulungu, Northern Rhodesia, Tanzania, World War I. Bookmark the permalink. I would be suffering from chronic constipation !! Though showering takes on a whole new meaning !! The long drop loo was surprisingly good and private (as long as you yelled or shone your torch to find out if anyone was in there)! We didn’t go down to the bottom of the waterfall in case you’re thinking that – that requires rock climbing and has reduced tough, strong Zambian men to shaking wrecks – very steep. 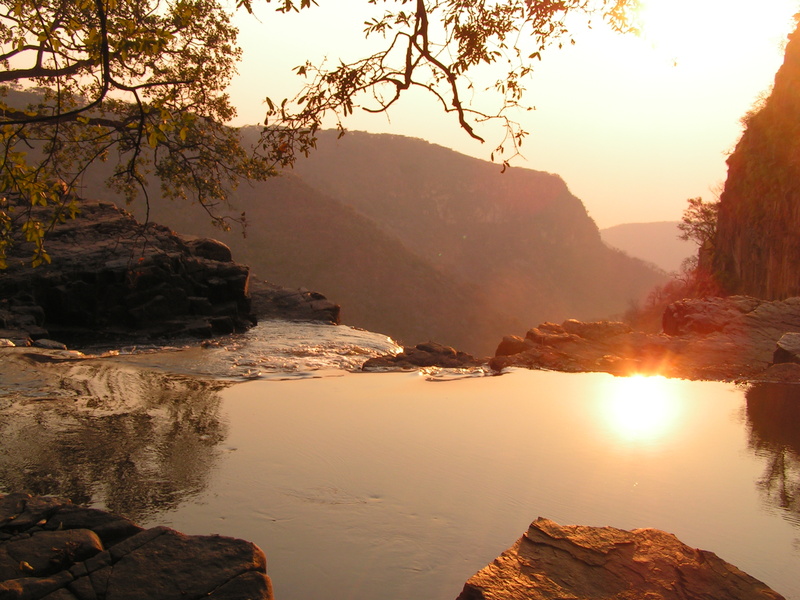 But the many steep steps down from the camp site to the top of the falls seemed designed to pitch me forward and the pool itself though lovely – well, put it this way, if you dropped your soap you could wave it goodbye! Beautiful pool. Almost tempts one to learn rock-climbing. Saw something like that in Queensland Oz and had the same thot. It would be too much to expect anyone to sell wet wipes … but did you bring them with you? 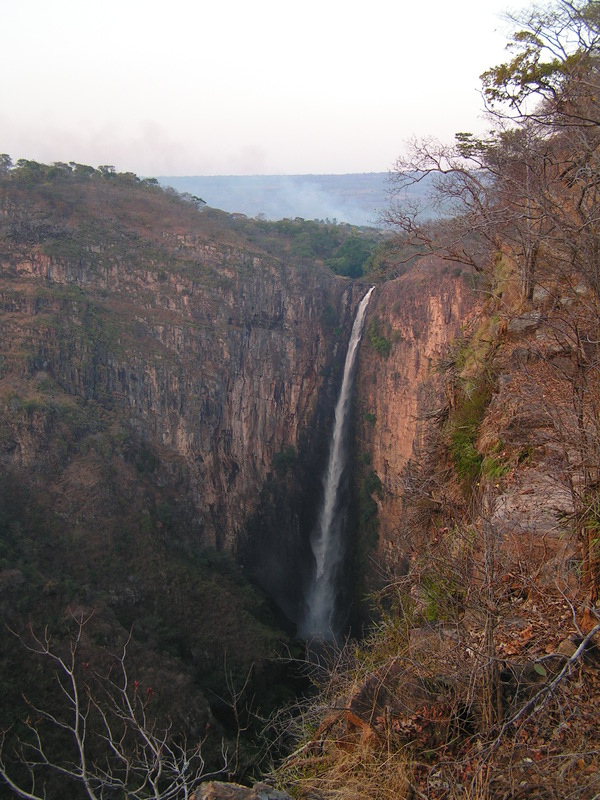 Hi Audrey – yes, it was beautiful – the camp site was above the pool and the falls, no-one would have attempted the climb beside the falls which had been known to reduce tough Zambian wildlife scouts to shaking wrecks! The steps leadiong down from the campsite to the lip of the falls were so steep that they terrified me, I do have bad vertigo and my knees just seize up if they don’t want to go. I had to go down looking at the ground and not ahead. One person lost soap as it floated over the falls! Wet wipes? Uh uh. We took up bowls of water for washing dishes etc and had our barrel for drinking and cooking (until it ran out). We were about 2.5 hours from the nearest shop thanks to the rough track down. Hi – loved your blog! I am researching a book and thought, folk on the Zambian side of the border climbed from the bottom. You say you were right on top? Did you go via Mbala? Or were you on the Tanzanian side? No, we were on the Zambian side, there’s an official camping site at the very top of the falls. And yes, we went via Mbala, hence the stuff about Abercorn and the market and Moto Moto museum – which is well worth a visit. Thanks for stopping by and good luck with the book. Let me know when it’s out.